Check out the updated sugarcane aphid info from K-State Research and Extension here. What is the sugarcane aphid? 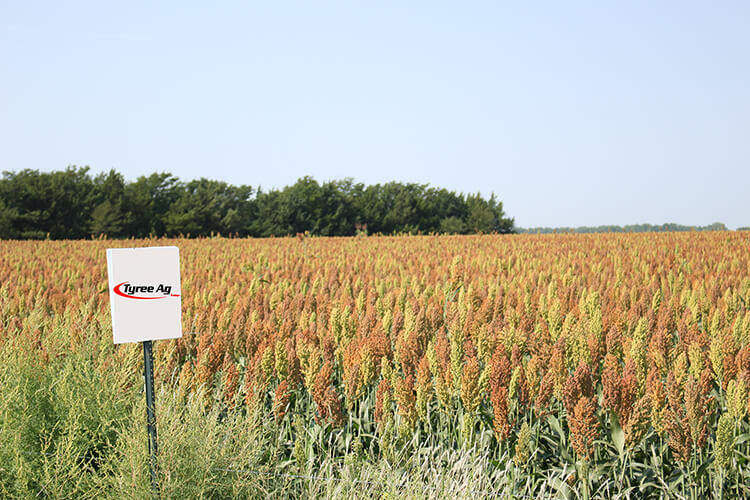 According to The Sorghum Checkoff's Defense Against Sugarcane Aphid: Stand Against the Pest, the sugarcane aphid (Melanaphis sacchari) was discovered late in the 2013 growing season in the coastal regions. This pest is new to the U.S. Sorghum industry and is capable of causing substantial damage to the crop if left unmanaged. Sugarcane aphids are capable of very high rates of reproduction and produce large amounts of honeydew. *Honeydew is made up of plant sugars and water, making it water soluble and washes off the plant by rain or irrigation. It is harmless to animals and eventually dries into a harmless residue if left on the plant. What crops are at risk? Sugarcane aphids will only survive and multiply significantly in sorghum genotypes, including Johnsongrass, shattercane, sorghum-sudangrass, sudangrass, forage sorghum and grain sorghum. They will not survive on any of the major crops such as corn, cotton, soybeans, or wheat. Sugarcane aphids are distributed by the wind, therefore the pests can be found in the later crops but have not been found to be of economic importance at this time. Sugarcane aphids are gray, tan, or pale yellow and is sometimes called the white aphid. A pair of black cornicles or tailpipes can be seen on the aphid's back end, with the tips of the feet and antennae being black as well. Groups (also known as colonies) are usually clustered around the midrib of the bottom side of the sorghum leaf. Leaves below infested ones will appear shiny and covered in honey dew (aphid excretion) and will have a shiny appearance which turns into a sooty mold after a period of time. 1. Fields should be scouted once a week for signs of the aphid. Once they are found, begin scouting at least twice a week. 2. The first sign of sugarcane aphid buildup in a field is usually honeydew on lower leaves. 3. To determine if an insecticide treatment is needed, note the presence and number of aphids on leaves in at least four areas of the field. 4. In each area of the field examined, collect a leaf from the bottom and top of 20 plants and observe the presence and number of aphids. Scout fields early and often using proper procedures to determine the level of aphid infestation. Consider planting a hybrid that has shown tolerance to the aphid and plant seeds treated with an insecticide seed treatment. Apply insecticide as soon as the action threshold is reached. Use only recommended insecticides and follow label rates and application instructions. If honeydew is present in upper canopy, consider applying insecticide in order to prevent potential issues with harvest. Avoid use of insecticides that are harmful to the beneficial insects. 1. All sugarcane aphids are females and are born pregnant and give birth to 1-3 offspring each day. 2. Sugarcane aphid offspring become adults within five days and live an average of 28 days. 3. A proportion of the aphids in a colony will develop wings as adults. These winged sugarcane aphids are then dispersed with wind currents. 4. They have piercing, sucking mouthparts and feed on the sap of the plant, taking away nutrients that would otherwise go to growth and grain production. 5. Sugarcane aphids excrete a honeydew substance that causes the leaves to be shiny and sticky. 6. These pests are known to overwinter on sorghum species as far north as central Texas. It is currently unknown how far north the sugarcane aphid can potentially overwinter, but it is doubtful they can overwinter very far north.